Earplay finished their season in style Monday night at San Francisco’s Herbst Theatre, with two World premieres and two West Coast premieres. Additionally, Earplay commissioned three of the five works on the program, no small feat for this small organization, and one that reveals their commitment to the next generation of composers. Recognizing that commitment, four of the five composers were present—the fifth, Jorge Liderman, died two years ago. Chris Trebue Moore wrote Amnesia Barrier to describe the long-term effects of ECT, Electroconvulsive Shock Therapy, and its barbaric misuse. The trio for flute, cello and piano was filled with tortured sounds. Flutist Stacey Pelinka, often heard with the Berkeley Symphony, lipped staccato highs across percussive piano and cello slides. The microtones created a texture nearly unbearable. And then an abrupt shift: low and hesitant piano notes were an uneven terrain for a flute that slid like a Japanese shakuhachi. The texture changed again, Leighton Fong scrubbing low on his cello, then bowing a high accent, a trickle of blood on the sand. Fong’s scratchy contribution held the density of electronics, but gained urgency as pianist Karen Rosenak added incongruous chords. One could imagine the erasure of personality under Rosenak’s fierce attacks, minor seconds and a slow unwinding, notes repeated faster and faster as they came to rest. Pelinka’s breaths amplified their silence. Turkish composer Tolga Yayalar wrote Terâneler to celebrate a Persian poetic form and the tension between melody and repetition. Violinist Joe Edelberg joined Earplay regulars Ellen Ruth Rose on viola and cellist Thalia Moore for a string trio that had a surprising emotional breadth. Also microtonal, Yayalar made use of quarter and three-quarter tones. Sound slowly built out of air to form phrases and drifting blocks of sound. Yayalar’s ancient tuning evoked wind-swept plains, and rich cello chords spiced the air. Lovely unisons and dissonances formed the ribs of the structure. The second movement was more active, staggered accents creating off-tempos. Moore’s cello painted with long bowed notes that slid up the neck as the higher strings nervously sketched. As the title suggests, Liderman’s material eddies and folds into itself, murmuring and cool, rhythmic and full of variation. The strings played sweet intervals under Josheff’s gruff bass clarinet. After intermission came the last two composers, Wayne Peterson and Hyo-Shin Na. Peterson’s Scherzo for Mixed Quartet held a clarity similar to Streams, but light-hearted rather than cool. Cellist Dan Reiter, soloist in the Oakland Symphony’s recent concert, brought the richness of marrow to their stockpot, and violinist Hrabba Atladottir was a lively addition. The two combined to balance the winds, Josheff on clarinet and Tod Brody on flute. Peterson’s evenhanded motifs integrated strings with winds, and one sensed an underlying joy. While eschewing extended instrumental technique, this was an experienced composer unafraid to expose each strand. A final treat was Hyo-shin Na’s Song of One Lost in the Fog, with all six original Earplayers and a startling koto solo by Shoko Hikage. 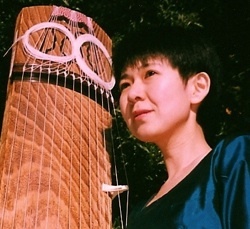 The use of koto in both pentatonic and contemporary modes satisfied a mingling of new and old. Hyo-shin Na’s writing is slippery and deep, with feathery clarinet entrances and the warm plink of koto. She was inspired by the poetry of American anthropologist Jaime de Angulo, and incorporated Pit River Indian melodies in the work, creating curious parallels between Eastern scales and the descendants of those who once crossed the land bridge from Asia. 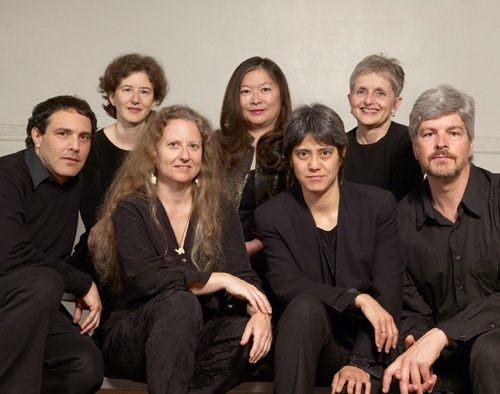 Photo top: koto player Shoko Hikage; photo bottom, from left: Tod Brody, flute, Ellen Ruth Rose, viola, Terrie Baune, violin, conductor Mary Chun, Thalia Moore, cello, Karen Rosenak, piano and Peter Josheff, clarinet.